Abstract: The fuel injector nozzle is critical to the performance and emissions of diesel engines. 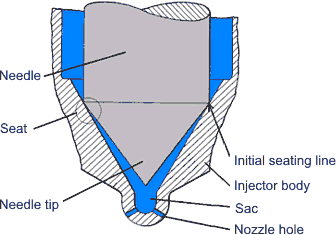 Some of the important injector nozzle parameters—including details of the injector seat, the injector sac and nozzle hole size and geometry—affect the combustion characteristics of the diesel engine, as well as the stability of the emissions and performance over the lifetime of the engine and the mechanical durability of the injector. Common rail—nozzle operates under more demanding tribological conditions and must be better designed to prevent leakage. Unit injector/unit pump—pressure pulsing conditions create more demanding fatigue strength requirements. Pump-line-nozzle—hydraulic dead volume must be minimized. Figure 1 shows a basic overview of the major components of a diesel fuel injector nozzle  . Several of these components are discussed in detail in the following sections. Readers should also review the introduction to injector nozzles that was given under Fuel Injection System Components.